Technical Description: SAMSUNG 160GB S2 PORTABLE USB EXTERNAL HDD BLACK - HX-MU016DA ( Samsung HDD) Samsung S2 Portable 160GB Hard Drive 2.5 inch USB 2.0 External (Black). Cool colors let you express yourself. Samsung S Series are as colorful as they are powerful. They come in six rich, cool colors so you can reflect your own unique sense of style and sophisticated taste. Whether you?re all business and take your technology in the striking traditional tones of Piano Black or Snow White, have a taste for the rich and soothing warmth of Wine Red or Chocolate Brown, or are naturally attracted to the bold, spring-like colors of Sweet Pink and Ocean Blue, the choice is yours. Store it in style. Samsung?s external hard drives take their externals as seriously as their internals. Designed to accentuate your fashionable image, these dapper, durable drives combine a glittery, ultra-glossy front cover with a luxurious, leather-like back to create a sophisticated aesthetic. And its design is as practical as it is elegant. It?s streamlined for comfortable handling with an anti-slip texture for secure gripping. And the futuristic blue LED light blinks when it?s busy working. Compact on the outside. Massive on the inside. Smaller and lighter than almost any other external hard drive on the market, the S2 Portable is the ideal storage solution for those who need to carry massive amounts of digital content when they?re on the go. With its desktop-sized capacity, this pocket-sized wonder is powerful enough to store up to 640GB of information. The unique inclusion of a USB on-board controller reduces the drive?s weight and power consumption, making it as efficient as it is compact. The key to worry-free data security. 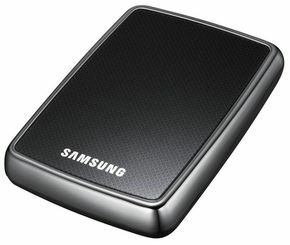 Protect your confidential information with Samsung?s external hard drives. They feature two distinct forms of critical protection for your data. SafetyKey? safeguards your back-up data with a password while SecretZone? creates a virtual drive which encrypts your data. With both password protection and virtual encryption, your data is safe so you can rest easy. A backup plan you can count on. Ever forget to back up important files and ended up losing everything? It?s happened to the best of us. That?s why Samsung created an auto back up feature for external hard drives. It?s easy to use and can back up in real time or on a pre-arranged schedule. So you can rest assured that no matter how busy your schedule gets, Samsung?s got your back-up. The interface that keeps pace with your life. Samsung external hard drives come with a variety of fast, secure connections. Our USB 2.0, the industry standard peripheral connection for most Windows-based computers, transfers data at a maximum rate of 480Mb/s. Samsung?s e-SATA, which is extremely effective for external storage applications, offers data-transfer speeds of up to 3Gb/s. And our USB 3.0 operates at an incredible 5Gbps rate, offering ten times the performance of hi-speed USB. .